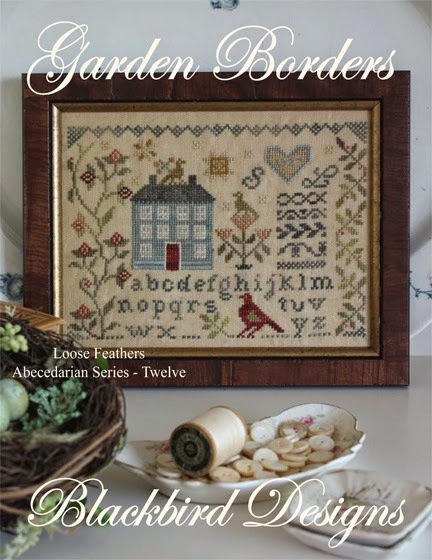 Finally......I've just finished the pattern for the last Loose Feather in the Abecedarian Series. Wanted to give you a peek of them all together. The pattern will be shipped out to the distributors on May 12th, and should be in shops the following week. Thank you, thank you, thank you because it's been driving me nuts not waiting for #12. Gorgeous!!!! Can't wait :-)! And have a good time at the beach with Barb. Beautiful! Thank you for the update. Just beautiful and I love the way you grouped them for hanging. SUPERB. I must add them to my stitching pile for next year, they look dashing all together. I'm not going in originality but your blog is so good you can not say anything other than THANK YOU! I've been going nuts, too, waiting for #12! And I have to tell you the sad news - My LYS has stopped carrying your designs. 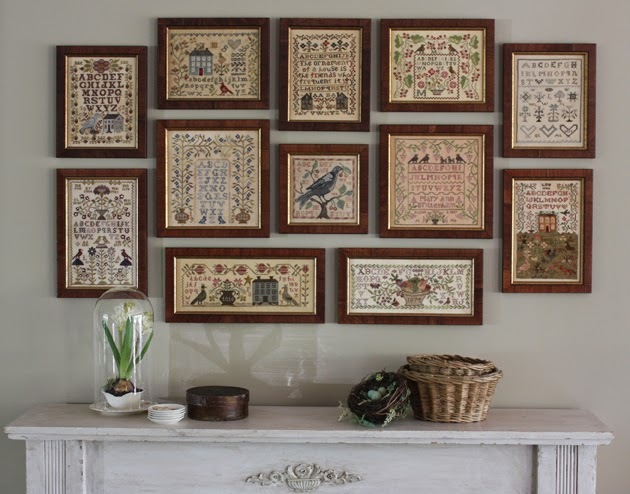 When I asked her why, the owner replied that every time she stitched a Blackbird Designs sample, the charts went flying out the door and she couldn't keep them in stock. So she decided not to carry them any more.....really???? Alma please!!!! The google traductor!!!! Alma - I have a question regarding one of your older patterns and I can't seem to find any info on it anywhere. Could you please contact me. My email is: cruiseletter@comcast.net. Thank you so much!!!! Hello, Alma! I love your designs and recently saw a mystery sampler , but can't find it. Can I buy the pattern ? In electronic form? Thank you! Sincerely, Elena. I am sorry for writing this here, but I can't find your e-mail. Alma I was just wondering if I could ask for a little help. I just bought Casting A Spell and my box for it. I am rather new to linen. I know how to calculate a solid piece but Casting A Spell is not like most patterns. I was wondering can you tell me how big a piece of the called for linen I should order to stitch it? Thank you and BTW I have only been back to stitching a year after 20 years away and I am sooooo addicted to BBD's I have a hole HUGE binder full of patterns to work on. I LOVE your designs!!! Thank you for designing such wonderful pieces!!! I'm following the Abecedarian series all the time.